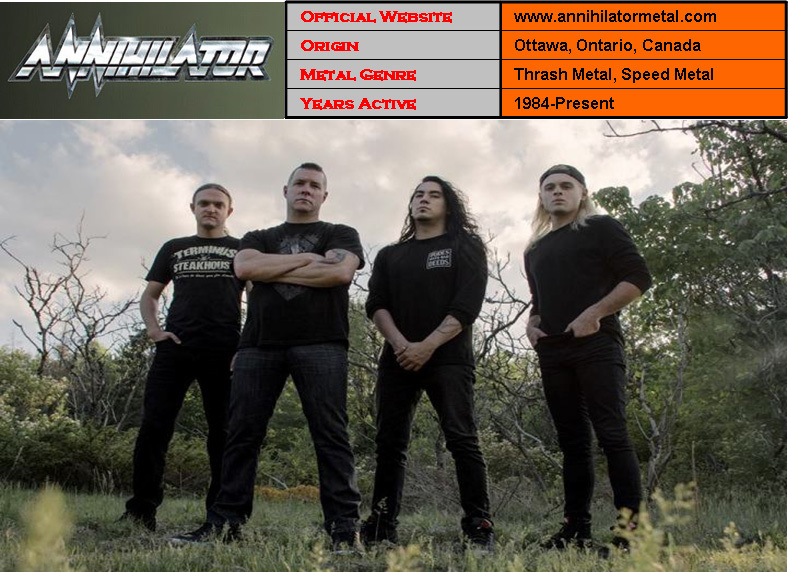 Annihilator is a Canadian thrash metal band founded in 1984 by vocalist, guitarist, bassist, songwriter, engineer, producer, mixer and mastering engineer Jeff Waters and former vocalist John Bates. They are the highest-selling heavy metal group from Canada in Canadian history, having sold more than three million albums worldwide, although most of their sales have been generated outside of the band’s home country. 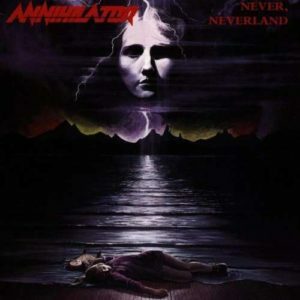 Annihilator’s first two studio albums — Alice in Hell (1989) and Never, Neverland (1990) — are considered to be influential Canadian heavy metal records. Many of their later albums also received high praise from critics, and enjoyed some success in Europe and Japan. Since its inception, Annihilator has released fifteen studio albums and has undergone many line-up changes. Waters is the only remaining original member left in the band, and sometimes assembles touring musicians to perform with him. Their latest studio album, Suicide Society, was released in 2015. Annihilator was formed in Ottawa, Ontario, Canada by Jeff Waters in 1984. Waters later wrote on his Facebook page that he named the band after the tank that Eddie Murphy’s character rode on in the 1984 film Best Defense. Waters and Bates then recruited drummer Paul Malek and bassist Dave Scott. This lineup lasted a year, producing a demo titled “Welcome To Your Death” during their time together. The demo received worldwide recognition and became highly sought after. After John Bates and Dave Scott left the band before its release, citing “artistic differences” and “personality conflicts”, Jeff Waters and drummer Paul Malek recorded another successful demo titled Phantasmagoria in 1986. This was said to be the third most-traded metal cassette tape in the 1980s, behind Metallica and Megadeth’s demo tapes. 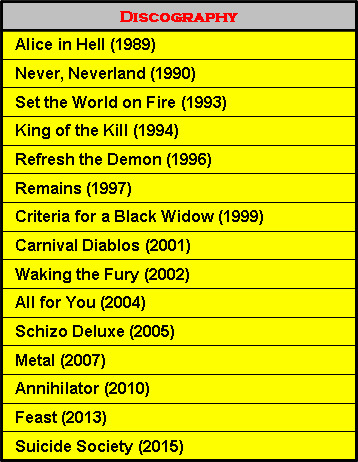 Some songs written at this time, by Jeff Waters and John Bates, ended up on Annihilator’s first two official studio albums (Alice In Hell and Never, Neverland). A third demo was recorded by Waters and Malek in 1987 and was sent only to labels. It included more songs that would end up on the first two Annihilator studio albums. Waters relocated to Vancouver in 1987, where he assembled an entire line-up, including drummer Ray Hartmann and former D.O.A. bassist, Randy Rampage, on vocals. In 1988 and 1989, Waters was in and out of a recording studio recording guitar and bass tracks and producing what would become the band’s debut album. Once the album was finished, he hired bassist Wayne Darley and guitarist Anthony Greenham. The band gained more recognition in the metal community with the release of their debut album, Alice in Hell, in 1989. Annihilator embarked on their first world tour, opening up for Onslaught in Europe on the In Search of Sanity tour, and along with Wrathchild America, they opened for Testament in the US and Canada on the Practice What You Preach tour, after which singer Randy Rampage quit the band to retain his seniority at a job on the shipping docks in North Vancouver. Without a singer, Jeff Waters found ex-Omen singer Coburn Pharr and the band released their second album, Never, Neverland, in 1990. The album’s sales surpassed Alice in Hell, becoming the band’s only album to chart in the UK at No. 48. 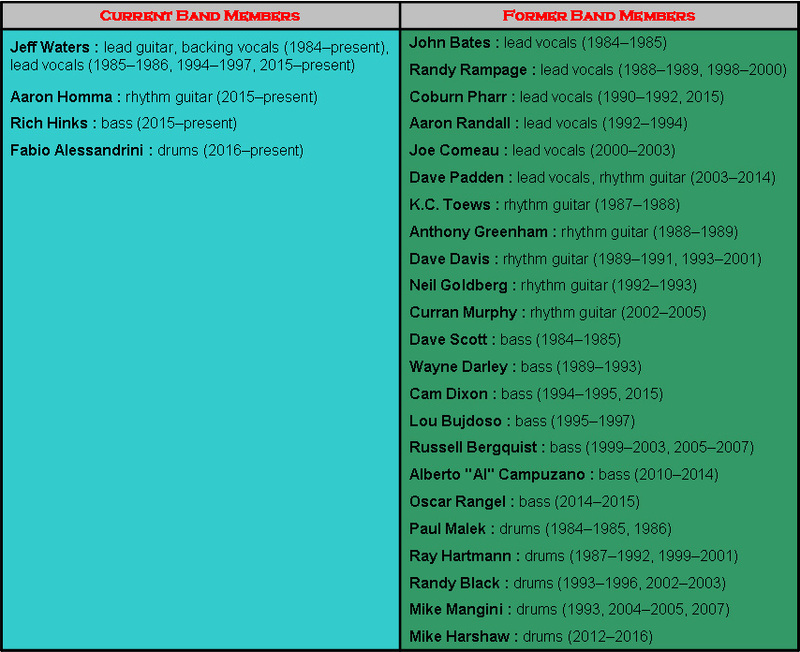 After opening up for Judas Priest, and then little-known Pantera and headline tours around the world, Hartmann and Pharr left the band and were replaced by Mike Mangini (though the band would find a more permanent replacement in Randy Black) and Aaron Randall, respectively. The band was signed to Sony USA by this point. The band’s third studio album, Set the World on Fire, distributed by Epic Records, was released in 1993 and was successful in Europe and Asia, but did poorly in the US. Bassist Wayne Darley had to leave the band in August 1993 as he was unable to enter Japan, where the band was touring in support of the album. Annihilator was among the many metal bands dropped by Roadrunner Records (and most other labels) that year. The line-up then dissolved, but Jeff Waters kept the band name going when he, along with drummer Randy Black, recorded and released King of the Kill in 1994. This album was more of a solo album for Waters, as it featured himself performing all instruments and writing most of the album’s material apart from playing the drum tracks, which were recorded by Randy Black. Bassist Cam Dixon later joined the band followed by Lou Bujdoso from Meatwagon who went on to tour and perform during the King of the Kill and Refresh the Demon tours. Jeff Waters continued performing lead vocals until 1997. The band released Refresh the Demon, which was, for the most part, a return to the speed and technicality of the band’s earlier days, in 1996 and Remains, a more industrial metal-oriented album which turned out to be the biggest flop of the band’s career, in 1997. By the time Remains was being recorded, Waters was the sole remaining band member. The album featured an electric drum machine (programmed by Jeff Waters, of course) and there was no tour in support of it. 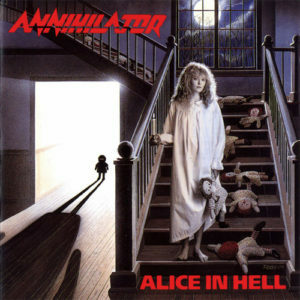 Annihilator did not play again until 1999, when Waters decided to reunite the Alice in Hell line-up to record another album. All members apart from Wayne Darley, who had health problems, agreed to reunite. Bassist Russ Bergquist joined the band in Darley’s place. This lineup released Criteria for a Black Widow and toured successfully. However, Rampage was fired following the tour for his erratic and often drunken behaviour. Former Overkill guitarist and Liege Lord frontman Joe Comeau replaced him on vocals, while Curran Murphy replaced Davis on guitar and Randy Black rejoined on drums. During the early 2000s, Annihilator released the albums Carnival Diablos (2001) and Waking the Fury (2002), both triumphant thrash metal masterpieces. After considerable success, the band’s lineup once again dissolved. Following years of line-up changes, Jeff Waters decided to work with a touring-only lineup so he recruited Dave Padden as a permanent vocalist/rhythm guitarist, while Waters recruited touring bassists and drummers. Annihilator’s first two albums in this three-man band format as Waters played both bass and guitar, with Padden on vocals and a hired drummer were All for You (2004) and Schizo Deluxe (2005). Mike Mangini rejoined for the former album in 2004 and Tony Chappelle was hired for the latter’s recording in 2005. In 2007, Annihilator released their twelfth album Metal. It features several guest performers, such as Corey Beaulieu (Trivium), Willie Adler (Lamb Of God) and Jeff Loomis (Nevermore). The band’s self-titled thirteenth album was released in 2010, coming to be in a more modern thrash metal-styled sound. Annihilator released their fourteenth studio album entitled Feast on 23 August 2013. 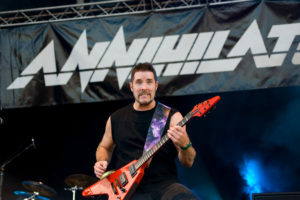 Dave Padden left the band sometime in December of 2014, telling Jeff Waters over a telephone call that he was sick of constant touring and the lifestyle he was living in Annihilator. By April 2015, Annihilator had begun work on their fifteenth studio album. Waters stated that the album’s musical direction would be “something quite different.” The album, titled Suicide Society, was released on September 18, 2015. Drummer Mike Harshaw announced via his Facebook page in May 2016 that he had parted ways with Annihilator after four years (with no hard feelings between either party) in order to spend more time with his family as well as to pursue other musical interests as he continued work with his own band, Prismind. Fabio Alessandrini joined Annihilator days later.